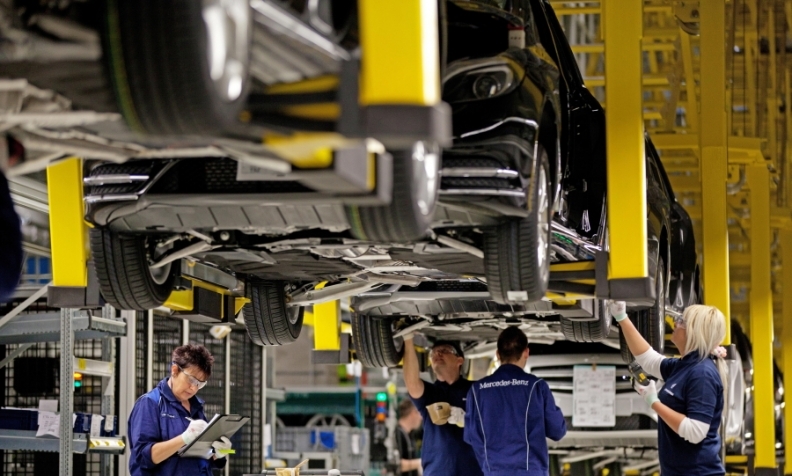 Mercedes' factory in Hungary (shown) will work through the summer months to keep up with demand for its new compact models. BERLIN -- Nearly three out of four companies doing business in Germany and the United States doubt that a U.S.-European trade truce reached last month will be followed by a lasting agreement on large-scale tariff cuts, a survey showed on Tuesday. President Donald Trump agreed during a meeting with European Commission President Jean-Claude Juncker in July to refrain from imposing tariffs on European cars and light trucks while the two sides said they would negotiate to cut other tariffs. The interim deal has reduced the risk of a full-blown transatlantic trade dispute, bringing relief especially for German carmakers and lifting business morale in Europe's largest economy in August. A survey by the American Chamber of Commerce in Germany showed, however, that company executives on both sides of the Atlantic remain skeptical, with 71 percent doubting whether a lasting agreement to cut tariffs can be reached. German Chancellor Angela Merkel and Trump agreed during a telephone call on Monday that they strongly supported ongoing discussions between Washington and Brussels to remove barriers to a deeper trading relationship, the White House said. Washington is pressing the EU to speed up the trade negotiations launched after last month's meeting between Trump and Juncker, German and U.S. officials told Reuters over the weekend.